When you decide to take up Nordic walking, you will be inevitably faced with the challenge of acquiring proper equipment. Good and high-quality equipment are functional, and ensure a pleasant and safe workout. Poles are the most important instruments in Nordic walking. Without them, one cannot practise Nordic walking. Since properly selected poles are long-lasting, your investment should be made with a long-term perspective. For instance, the following example may come in handy. When you purchase proper jogging shoes, and you wear them a lot, you need at least two pairs of shoes per year. For instance, more earnest marathon enthusiasts always use several pairs of similar running shoes at the same time. So the annual consumption is about 2 – 4 pairs. 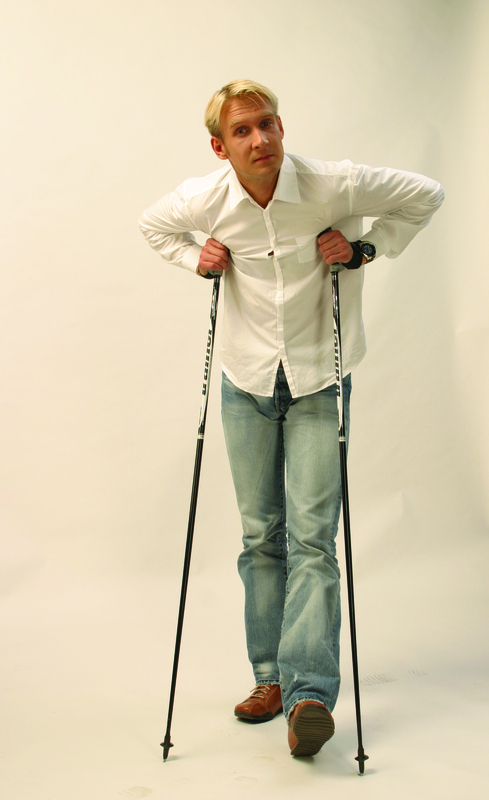 When you purchase proper Nordic walking poles, you will use them for a very long time. Replacing of some consumable parts, such as straps, asphalt paws and spiketips, from time to time is quite normal. Below, we shall discuss the selection of poles and related factors. Nordic walking poles must be shorter than poles intended for cross-country skiing. The reason behind this is the fact that in skiing, the advancement speed is faster than that of walking; furthermore, in winter, the spiketip tends to sink into the snow to a certain depth. The best way to make a good start in purchasing the poles is to go to the pole department of a sports gear shop, where you can select your walking poles based on the criteria described above and the measurement spread provided in Table 1. Reliable and appropriate poles are an integral part of successful and lasting Nordic walking experience. To select poles for fitness exercising, the following formula is used for selecting the proper length of poles: 0.70 x own height. The use of the co-efficient 0.7 shows that a woman of 170 cm height needs poles of 120 cm in length (170 x 0.7 = 119 cm). The height of a walker is not, however, the only factor having a bearing on the size of the pole. The physical fitness, flexibility of joints, proportions of limbs, pace and the terrain of walking should also be taken into account. Furthermore, it is necessary to take into consideration the technical skills, as well as the long-term purpose of the poles. Table 1. Represents three different size options as well as a guideline to those who plan to acquire a set of poles. 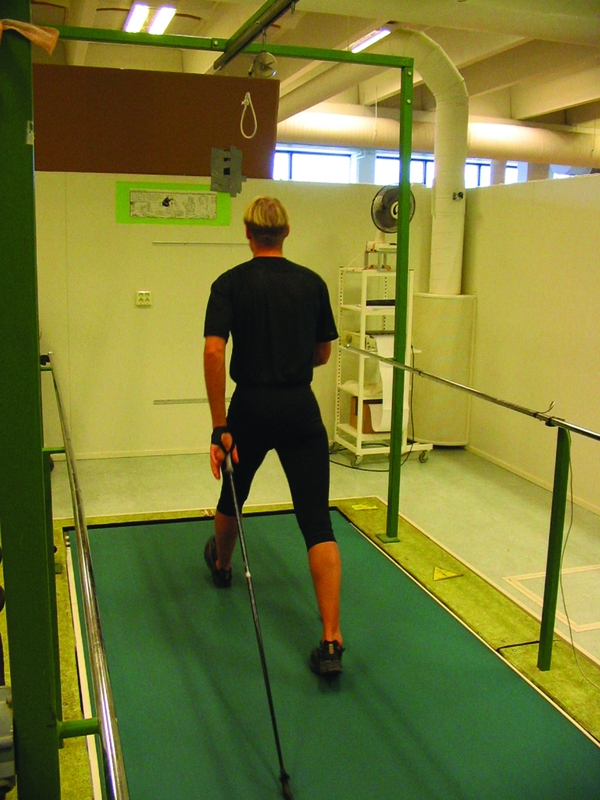 • When you walk with poles do you get a natural and efficient sensation of movements? • Poles of proper size (about 0.7 x your height) ensure movements that are naturally suited to you. This principle applies perfectly to the majority of Nordic walking enthusiasts. • Your elbow being at a 90 degree angle in relation to the ground when you are holding a pole is a good rule of thumb for determining proper pole size. 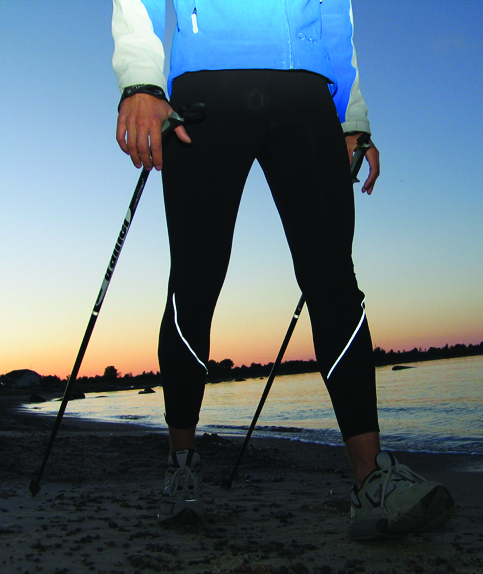 Proper techniques and effective training in Nordic walking are best achieved when equipment specifically designed for Nordic walking is used. The design of Nordic walking poles must be based on the ergonomics of the palm, where a specially patterned wrist strap supports the palm, so that there is no need to squeeze the grip when walking, while also being easy to adjust. The hard-metal tip of the pole, or the spiketip, penetrates the ground at a proper angle, ensuring optimum grip. A special asphalt paw has been developed to reduce impacts and noise, as well as to ensure a dependable (positive) push when walking on asphalt. 1) A modelled grip and strap that help ensure the accomplishment of proper Nordic walking technique, rhythm and motion. 2) Long-lasting, lightweight and rigid shaft, which provides suitable flexibility. 3) A spiketip designed specifically for Nordic walking, which takes into consideration the alterations of the terrain; as well as the asphalt paw mounted on the spiketip when walking on asphalt.